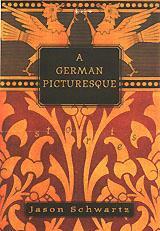 Book review: "A German Picturesque"
This review first appeared in the American Reporter in 1998. Jason Schwartz has what most of us who attempt this writing gig lust after: A distinctive voice. With all of us millions of chimps pounding away on keyboards hoping to be the lucky ape who stumbles onto the accidental Shakespeare, Schwartz has still managed to come up with something unique: You need read just a few of his words to know instantly who the writer is. Which is a rare feat in any age, and one that few have pulled off. Most of those who did manage it got immortality for their efforts. Ernest Hemingway. Truman Capote. Marguerite Duras. Mark Twain. Like them, Schwartz has a writing style that is immediately, forcefully recognizable, both for its meter and its highly stylized vocabulary. Schwartz's voice is heavily steeped in minimalist imagery and surrealistic impressionism  the vivid colors of Chagall coupled to the clipped phrasing of Camus. "Mother takes child on a visit. Towns, you understand. Cottages. The evening meal. "Cornish hens or a stew. Bliss potatoes. Cabbage. Artichoke hearts. "There are parcels, as well?" "The sisters went away on holiday. They were old. The maids would steal from them. "The sisters kept cut flowers in a vase. "They took their meals in the room. They watched the ships at the window. They shut the trunk tight." But as beautiful as Schwartz's prose is, he never does anything with it. It keeps building up, making you think it's going to become some wonderful combination of words and drama like John Knowles' "A Separate Peace" ... only it all keeps petering out. It's all foreplay and no climax  which is more frustrating than nothing at all. In that, he is akin to Josephine Hart, whose wonderfully delicious voice is ultimately wasted on superficialities like "Damage" and "Sin." Perhaps wisely, Schwartz aims lower than Hart  he doesn't even attempt full novellas here, instead offering small observational sketches; writing exercises, really, that show great technique and style  but, as of yet, nothing more. Perhaps he has nothing further to add, no depth to pour into his art. Perhaps, as with the weekend artists grinding out technically competent but still empty paintings to sell the tourists, that's all there is: a modicum of talent and a hunger for something more that never will be. Such would be a far crueler fate than that gripping the rest of us aspiring writers, writers whose staid prose offers not even a glimpse of the genius evident in Schwartz's beautiful constructions.